Grim Flayer is great. Longtusk Cub is great. Even Glint-Sleeve Siphoner can be pretty effective. You know what’s even better? Three toughness. 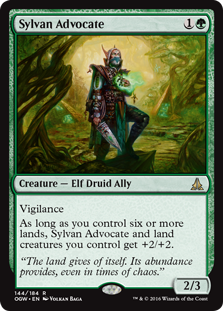 Sylvan Advocate comes down as a 2/3 (forget about its size in the future)… Meaning that it can withstand a Shock on turn two, unlike the other B/G two drop options. As a 2/3, it also pwns tiny 2/1 Earthshaker Khenra. Mike’s sidekick over at the Ancestral Recall Podcast, Roman Fusco made another Star City Games Classic Top 8 last weekend… This time with an innovative U/W Approach of the Second Sun deck designed by Roman’s frequent collaborator (and Regional Finals victim) Dan Ward. This U/W deck is truly creature-less (and for purposes of Torrential Gearhulk, artifact-less). That completely blanks Earthshaker Khenra teammate Abrade. While haste is helpful across many of the Mono-Red deck’s creatures, the ability to prevent blocking also takes up relevant space on the text box. Against no creatures? No additional value. 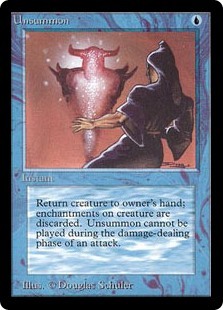 The old school instant has an amazing superpower against Mono-Red. If the opponent has one card in hand only, you can Unsummon another creature (putting a second card in the opponent’s hand) to blank an attack by Hazoret the Fervent. 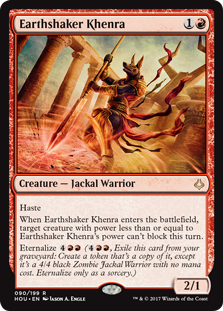 And of course, if you Unsummon the 4/4 backside on an Earthshaker Khenra, that will be that. 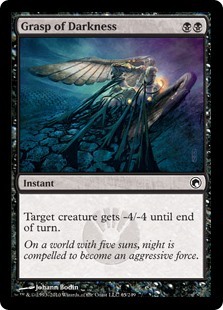 Grasp of Darkness really, really hates Hazoret the Fervent… But will settle for murdering a hasty Jackal Warrior, let’s be honest. Grasp’s new teammate Gifted Aetherborn, though… 2/3 over 2/1 again, etc. etc. And if the Red Deck needs to spend its second turn pointing an Abrade at Gifted Aetherborn? It won’t even have time to drop Earthshaker Khenra on curve. To find out what other cards and decks are creating a hostile Standard environment for our poor Jackal Warrior, check out this week’s episode! How ’bout Them Ramunap Ruins?